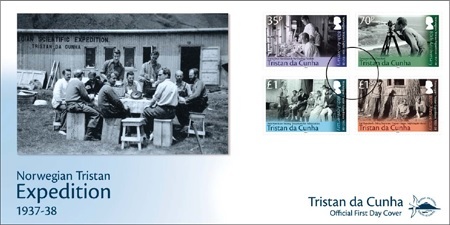 Stamps commemorating the 80th anniversary of the Norwegian scientific expedition to Tristan in 1937-1938. The expedition was led by the botanist Erling Christophersen. In the spring 1933 the Botanical Museum of the University of Oslo received a parcel of botanical samples collected on Gough Island. They were collected by the whaling ship-owner Lars Christensen in just a few hours, but despite this, the collection contained 12 species new to this island, and three previously undiscovered species. Christophersen was intrigued with Tristan da Cunha, and started to plan an expedition. Earlier scientific expeditions to these islands had stayed for less than a week, whereas this lasted for four months, from December to March. This was the whaling season in the Antarctic summer. The whaling industry was important in Norway and essential for the expedition. The botanist Christophersen contacted Christensen for funding and support, and he was more than willing to help. His whale factory ships could transport the expedition to the island at the start of the season and pick up the crew on the way back to Norway. The expedition had 13 participants and could hardly have been more multi-disciplinary with: botanist, algologist, land zoologist, marine zoologist, geologist and a surveyor. But this was not only meant to be a science expedition. In 1937 there were 188 Tristanians on the island who were to be studied by a physician, a dentist and a sociologist. The expedition members arrived onshore 7 December, 1937. They brought with them equipment weighing 100 tonnes, including building materials for the research stations. They were given a warm welcome and were installed in the parish hall until the expedition station was erected. The dentist and the physician had their field lab inside the expedition station. 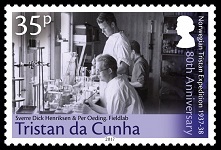 On the 35p stamp the physician Henriksen and the medical assistant Oeding are photographed doing lab work. The man in the background is the sociologist P.A. Munch. He, of course, had no need for a lab. He visited the Tristanians in their homes and observed them in their work to study the society. The dentist Sognnæs had his field lab and a dentist chair with all equipment next to this lab. He was intrigued by the good dental health in the population. He wanted teeth for his lab research and the deal he offered was a chocolate bar for a tooth! The goal of the expedition was to collect everything of interest. To do this, one needed to map the terrain. 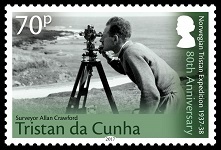 The 70p stamp shows surveyor Crawford at work. He started out mapping the coastline and worked towards the centre of the island. Later, official maps were made based on his surveys. The geologist Dunne analysed the volcanic islands, asking questions like when were they formed and how has the climate shaped them over time. 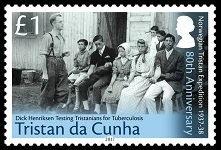 The £1 stamp shows Tristanians lined up on a bench outside the field station where they were tested for tuberculosis by the physician Henriksen. The population wasn’t just known for their good dental health, but also for their good health in general. Henriksen joined the expedition to try to understand why they were so healthy. The biologists did fieldwork around the island, and from boats around the coast. In addition to the main island, they did fieldwork at the islands Inaccessible and Nightingale. To get to these islands they had hired the Norwegian adventurer Erling Tambs with his Norwegian Spitzgatter RS Sandefjord. The islands are populated with many birds. The land zoologist Hagen led the work of ring marking two thousand Great Shearwaters (Puffinus gravis). Some of them were later found off Newfoundland and in Norway. They also found a Tristan thrush (Nesocichla eremita) which was considered extinct. 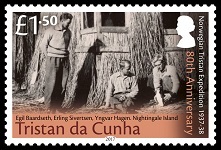 On the £1.50 stamp on Nightingale the marine biologists Baardseth and Sivertsen are watching Hagen with a Northern rockhopper penguin. They are sitting outside their simple field lab, with walls made of tussock grass. On 29 March the whaling factory ship Thorshammer arrived. The field station and most of the remaining equipment was given to the Tristanians; a small gift compared to all the help the expedition had received during the months on Tristan da Cunha. Back home in Norway the expedition members analysed their research materials and in the following years published more than 50 scientific papers from this expedition to Tristan da Cunha.